Selenity is a UK tech firm that provides a cloud-based expense management system, HR case management and a contract management solution. They are feature-rich, easy-to-use, reliable and technically advanced (we will dig into the product in part 2). Looking in more depth, the Lincoln-based firm is a multiple-award winner for its advanced technology, innovation and SME business success. From its roots in 1989, it has developed and honed its expenses product into the market-leading system it is today, now used by 400+ firms (including 67% of major NHS organisations) across the UK. Selenity is one of the few independent, privately owned British software firms in the procurement market. What is it, we thought, that is driving the continuing success of an SME in a tough, over-populated marketplace? Last year we talked to the firm’s CEO, Neil Everatt, about its rebrand, why and how it came about – and you can read that here. A year later, we decided to pay the firm a visit, in beautiful and historic Lincoln, to take a closer look at what is driving its expansion and upward development. So from a company ethos point of view, the first thing to report is the overwhelming sense of ownership that comes from the employees; their energy is certainly driving the company forward. Selenity is still privately owned after 30 years, “owned by the people who work here,” as Neil says. “We are small enough to be agile and we make our own decisions.” We met up with each department and got a good understanding of what they do, and why they are genuinely passionate about their role in the firm’s success. From ideas development, to code writing, to testing, implementation, sales & marketing, and aftercare, the workforce comes across as dynamic and highly involved. You could probably put that down partly to the place itself – it’s open plan, colourful, bright, and built with the employee in mind. 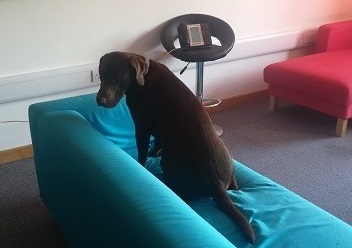 There’s a games/chill out room, the company tuck shop, comfy sofas, a flexible working environment – testified by the aftercare team who are on call 24/7 but who have the ability to work around school hours for example – and even the company dog, Sweep, who seems to be everywhere at once! It all contributes to a ‘happy’ workforce. Neil’s philosophy is ‘you only get out what you put in.’ And he’s right of course, he takes time to understand and cater for his employees’ needs, and they reward him with loyalty and dedication. But there must be more to it than ‘taking care of your staff and they’ll take care of you.’ We’ve found in the majority of success case stories we’ve covered, that it’s ‘what comes from the top’ that inspires commitment and pride. Neil is a true advocate of social responsibility and wider social value. Talking to him we find they’ve been ‘doing’ CSR since the beginning, and they have a great name for it: ‘recycling your success to help others.’ And in their case this means local charities, sporting associations, and local education. Selenity actively spreads its talent and learnings back into local schools, where it helps young people with writing CVs, runs mock interviews and generally talks to students about opportunities and making the best of their employment prospects. “Engaging with local schools is one of our passions,” explained Lewis Hughes, Marketing Executive. “It's all about preparing students for the world of work. And of course, we hope we are prepping our own future skilled workforce!” The firm also offers work experience and internships. Their ongoing growth means they are recruiting steadily in all areas, so preparing future generations of local software developers, code writers, and so on, has mutual benefits. “We have actively saved on recruitment fees,” explains Deborah Saunby, Sales & Marketing Director, “just by getting out into the local world, meeting with, talking to, and helping prospective employees.” Recruiting locally where possible also means they support the economic growth of the region. Selenity did have two locations in India, but owing to factors beyond their control, like rupee/pound unfavourable differences, cultural challenges, and Internet issues, they brought it all back in-house, helping Lincoln grow its tech-savvy people pool. And we mustn’t forget of course that Selenity is very proud of its local football club, Lincoln City, for which they sponsor the pitch-side boards, and are the official sponsor of their away kit. And we'll be taking a more indepth look at the solution in Part 2.